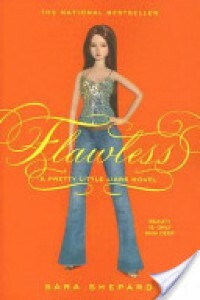 I read Flawless (PLL#2) before Pretty Little Liars (PLL #1) because I have watched the first three seasons on PLL on ABC Spark and knew that the beginning was pretty much the same. However, just in this book alone there are some significant differences between the books and the show. Thankfully I was able to follow the story okay because of that, but I'm still going to go and read Pretty Little Liars (PLL#1) before I move on to Perfect (PLL#3). As a book I though Flawless was a fairly easy read, which can only be said as a positive comment on Sara Shepard's writing style as the book is narrated by four separate people. Although I've watched the show, the book offered much more detail, and a slightly different plot than the show. I'm really glad I decided to pick up the book (well, ebook).